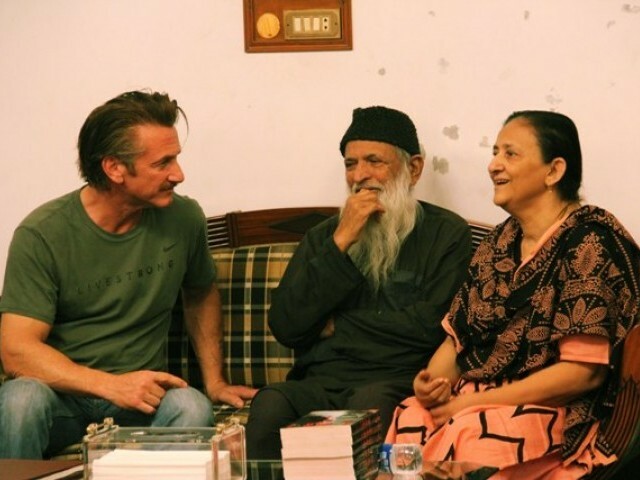 In a t-shirt, jeans and sneakers, the rather unassuming actor Sean Penn stepped out of his car to meet Pakistan’s iconic humanitarian worker Abdul Sattar Edhi and his wife, Bilquis Edhi, at their home for children on Saturday morning. While the Academy Award-winning star of Dead Man Walking is instantly recognisable to film buffs, the Edhis were unaware of who their visitor was. Penn, who was accompanied by US Consul General William J Martin and a slew of consular staff, told Edhi that it was a “great honour” to meet him. “Your name is brought up with reverential appreciation,” Penn said. In return, the Edhis were told about Penn’s philanthropic efforts to help the survivors of the earthquake in Haiti in 2010. Penn toured the Bilquis Edhi Female Child Home in Clifton, dipping into classrooms where Montessori students sang the nursery rhyme ‘Are you Sleeping, Brother John?’ eliciting smiles from him and Martin. The school at the home has 250 students and offers classes till Matric or tenth grade. As the aroma of food being prepared for lunch wafted in from the kitchen, Penn stepped into a separate room to chat with the Edhis. Bilquis later told the media that Penn said he had wanted to meet them, and there had been no talk of donations or offers of help. “We get enough from Pakistanis, we do not take money from abroad,” Bilquis said. She said Penn had told them that he was happy to be there and that Pakistan was not as bad as people had made it out to be. Penn’s first visit to Pakistan included travel to Badin and Karachi and he was expected to leave on Saturday. Before arriving at the Edhi centre, he also visited the nearby Abdullah Shah Ghazi shrine where he paid his respects.